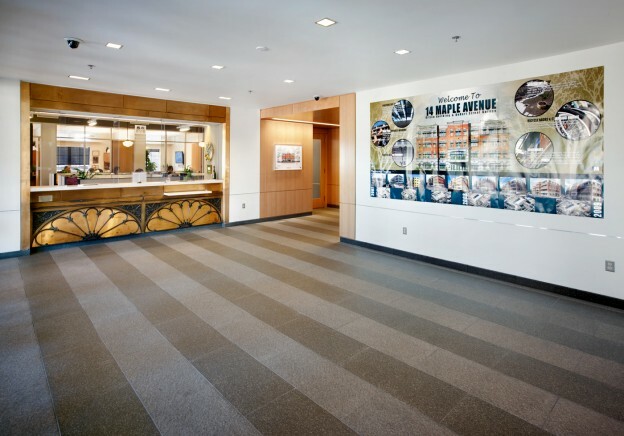 Interior fit-out of the Morristown Parking Authority’s office headquarters and interior design of 14 Maple Avenue Office Building’s core infrastructure, which achieved LEED Gold Certification. Sustainable materials include recycled porcelain floor tile, FSC-Certified wood veneers, low VOC paints, and re-purposed antique light fixtures and bronze fans. A green design strategy includes the combination interior light shelves with light colored paints and glass partitions to reflect daylight and reduce the requirement for artificial lighting. Large scale graphic images and sign boards in the attached parking garage. Posters and framed diagrams at the ground floor lobby. “Green Guidelines” distributed to all building tenants to demonstrate the building programs including recycling, green cleaning products, bicyclist amenities, and energy saving strategies.